Have a Bite! The Red Dog Tavern, an Adirondack tradition since 1982, is chef-owned and operated. 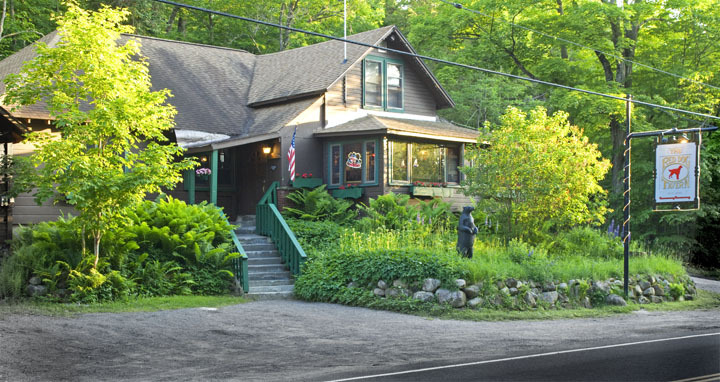 Originally built in 1923, it’s great for grabbing a quick bite or a relaxing meal in a unique and truly comfortable Adirondack atmosphere. Where locals meet, the soup is homemade, the bartender remembers you, and you’re bound to have a good time! We are passionate about the food we serve. Each meal is freshly prepared one dinner at a time. We’ve been famous for years for our mouth watering BBQ pork baby back ribs and pulled pork cooked low and slow the way it should be, overstuffed quesadillas, awesome salads, crispy wings with our own tasty sauces, and our original Roman candles. Join us for a laid back dining experience or just drop in for a cocktail and munchies. We take great pride in serving awesome food with lots of smiles from our friendly staff.